There are 100 other images of this object. This object has no known copyright, and as such we offer a high-resolution image of it. See our image rights statement. See more objects with the tag personal, recording, experimentation, swatches, notebooks, notations, dyes. This is a Dyer's record book. It was made by Edmund Barnes. It is dated 1820–39 and we acquired it in 1950. It is a part of the Textiles department. This record book was the personal property of Edmund Barnes, a textile dyer and printer from northern England. 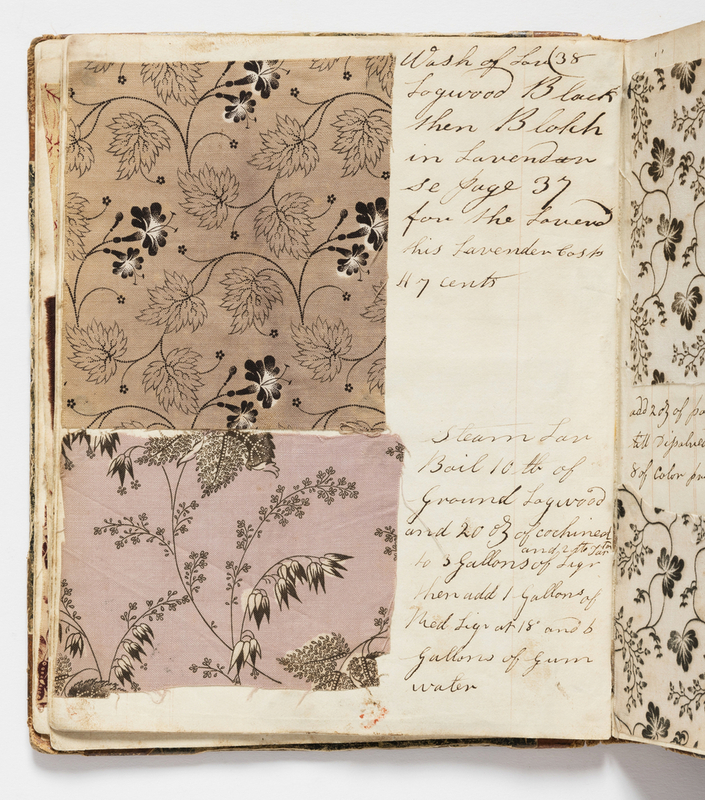 Barnes was working at an unspecified print works when he began recording his dye recipes, probably in the early 1820s. The inside cover has an inscription: “Blackford Bridge near Bury,” which is near Manchester, England – an area known for its leading role in the development and industrialization of textile printing processes. Barnes worked in the period before the development of synthetic dyes. Cotton could be resistant to the many natural materials that readily dyed fibers like silk and wool. Barnes’ recipes include dyestuffs like cochineal, madder and logwood, along with alum, dung, lignin, pipe clay, prussiate of potassium, and chromate of potash. Some of these ingredients are mordants-- metallic salts that help dyes to bond effectively to cotton fibers. Study of Barnes’ book reveals that at some point in late 1820s, he left England for New Hampshire, where he was employed by the Dover Manufacturing Company to teach American apprentices the practice of “steam printing,” a process used to produce colorfast fabric. His first entry there is “Dover Nov 18th 1829," and he continued to add recipes and swatches until the early 1830s. “Providence” is inscribed on the inside back cover of the book, and research supports the idea that Barnes left New Hampshire for Rhode Island; another of his record books is in the Museum at the Rhode Island School of Design. 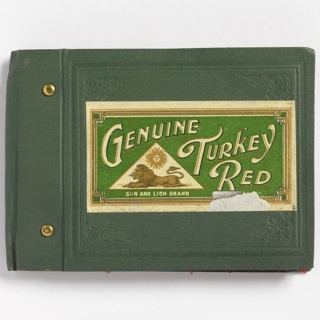 This object was featured in our Object of the Day series in a post titled A Recipe Book for Dyestuffs. This object was purchased from James J. Kane. It is credited Museum purchase through gift of Jaques Séligmann. label: woven cotton samples, leather binding, paper label, brass rivets. On p. 33: "Nov. 18th, 1829." On front cover: "BLACKFORD BRIDGE NEAR BURY SEPT. 7TH. EDMUND BARNS." On fly leaf at back (torn): "Edmund Barnes, Providence."